In the dog days of summer, is there anything more delicious than a huge pile of freshly cooked French fries? Sure, you could reach for watermelon, strawberries, ice cream, or even a boozy popsicle, but when you need a hearty snack that also satisfies your inner child, fries are the only option. But not every cut of French fry is created equal. And so, since July 13th is National French Fry Day, the HelloGiggles office got together and hashed out once and for all which cut of French fry is the absolute best, and which cut you should only eat when you have no other options. Please note we left sweet potato fries, chili fries, truffle fries, and all other “flavored” fries off this list, since this exercise was all about which cuts are best. Don’t @ us! They’re thick, they’re chunky, they sometimes have a damp and smushy mouthfeel — coming in dead last is steak fries. Our office agreed almost unanimously that steak fries are the least appealing cut of fry, with one editor even saying they “taste like they have napkin in them.” Our guess? The potato-to-oil ratio skews too much potato, so you lose that ever-appealing crunchy outside/soft inside texture. A brunch staple, these “fries” are the least traditional French fry cut on the list, but we had to include ’em because of their name. Their potato-to-oil ratio is still high, but because they’re a smaller cut than steak fries they scored more points with our newsroom. Plus, since they’re usually cooked with the skin on, they’re the healthiest option on this list (just go with it). We’re entering the fun fry portion of this list, beginning with crinkle cut. They’re probably best known as a menu staple at Shake Shack, and they stand up masterfully to heavy ketchup dipping. A solid option if you’re in desperate need. Ah, shoestring fries. Perhaps the most controversial cut on this list, shoestring fries drew a wide range of opinions around our office. They’re by far the thinnest cut on this list, and that’s what makes them appealing and what turns people off. They’re not great for dipping, but they’re satisfying to eat because you can shove about 30 in your mouth at once and feel like you’re eating just one steak fry. Chick-fil-A fans are devoted to the chain’s waffle fries, and for good reason — this French fry cut has a high oil content (it’s like a dozen smaller fries were stitched together!) and their texture gives them a great mouthfeel. It’s no wonder they landed high on this list. 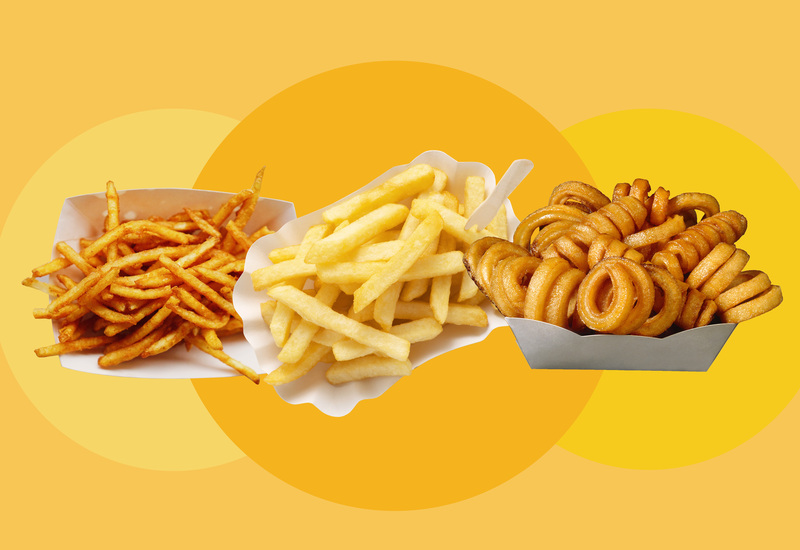 We can probably all agree that curly fries are the most consistently crispy cut of French fry, and that’s what makes them so beloved. They have a pretty substantial surface area, but because of their shape, that surface area crisps up nicely in the fryer and leaves the insides soft and chewy. You can find these babies at almost every diner or fast food joint in the U.S., not to mention frozen in bags in the freezer aisle, and they’re perfect no matter what — whether they’re a little soggy from chilling under a takeout burger, or fresh out of the fryer with their peels still on. You can never go wrong with a 1/2-inch thick French fry. Mmm, yes please. We’re talking about McDonald’s-style fries here. Thin, crisp as all get out, and with the perfect potato-to-oil ratio, skinny fries took the crown among HelloGiggles’ editors. We’ll be snacking on these crispy potato champions all day if you need us.